For the last few years, we have closed the hotel to guests for a few weeks during the month of December, in order to carry out renovation work on the hotel. Owner Jane Carson has been working closely with Kieron Cockley of Fowey interiors shop, Brocante Ltd to concentrate on making changes to three of the hotel rooms. Kieron says, “Jane approached me at the end of the summer with a view to refreshing several of the rooms at The Old Quay House. I’m fortunate enough to have a home and gift shop called Brocante in Fowey, and Jane was aware that despite the limited space we have in the shop itself, we stock a vast array of furniture and accessories that aren’t always on display. The Old Quay House is a dream project for me, as it would be for any interior lover: a boutique hotel, with a great reputation, and enviable views of Fowey River to make the most of. It is also a great opportunity to show the quality of design work we can provide at Brocante. “Jane and I decided there were three rooms that needed updating, with a few touches in the lounge area. 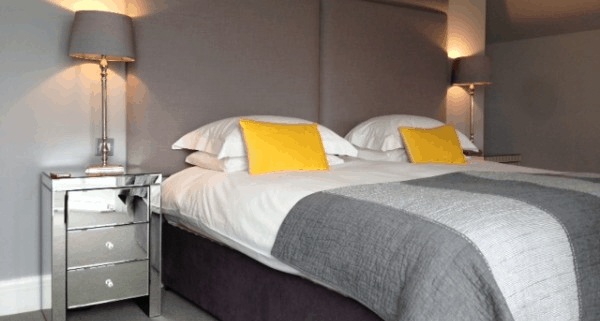 Clearly being a unique hotel, in a town with as much character as Fowey has, each room must be individual, beautiful yet practical, and luxurious while including useful furniture and accessories. People come to The Old Quay House with the expectation that it’s going to be better than home, and that’s what we need to provide in every detail. We are looking forward to re-opening on Christmas Eve to welcome guests who are spending Christmas with us. We will be sharing more images of the finished rooms on the blog at a later date! Stay up to date with news from Brocante Ltd via Facebook and Twitter.